When I am in need of a quick dinner, I usually make some kind of stir-fry combining whatever protein I have in the house and whatever veggies I have around. 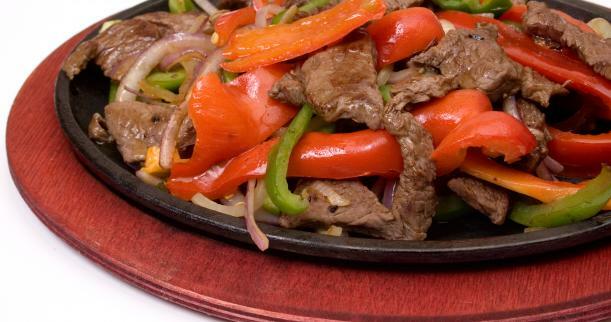 Last night I decided to do this and make simple fajitas with a quick, home-made fajita seasoning and some skirt steak. Throw in any veggies you want and adjust the spice according to your preferences. This can also be made with chicken and for folks in the Attack phase or on protein only days, this can easily be made without the veggies. 1. In a bowl combine the ancho chile powder, salt, cumin, garlic powder, and cornstarch. Add the beef strips and stir to coat all the beef with the spices. 2. Heat the skillet over medium heat and add the cooking spray. Add the beef and saute for about 5 minutes or until cooked to your liking. Remove the beef and set aside. 3. Add the vegetables to the pan and cook for 5-7 minutes or until they soften. Season with salt and pepper. 4. Add the steak back to the pan and cook for 1-2 minutes to combine the flavors.